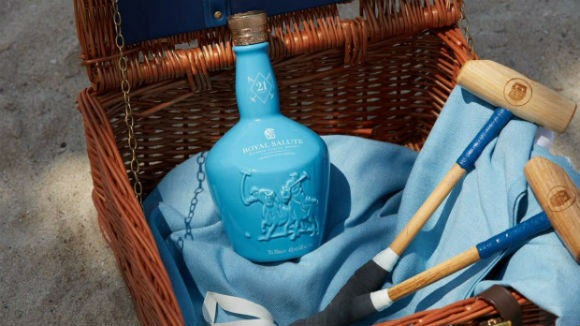 I’m talking about polo, of course, and in particular the long standing relationship between this centuries old, horseback, royalty-attracting sport and the Royal Salute blended whisky brand. For over a decade, Royal Salute has supported the sport, and currently sponsors 15 polo tournaments all over the world. 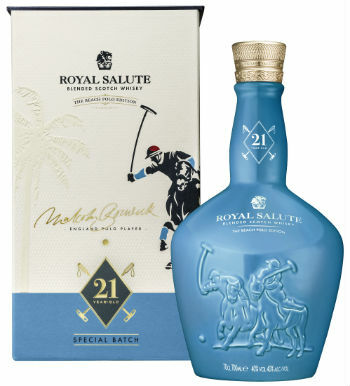 I quite like the hook up between Royal Salute and the polo world. Some will say it’s perpetuating whisky’s (perceived) elitist status, or pandering to the clichés of a bygone era, but when I think of polo, I think of Pimms, champagne, and overly-garnished G&Ts… so anything get the well-heeled spectators to move on to whisky, eh? But enough with the quotes. Let’s get to the liquid. Nose: Initially light notes of fruit salad sweets, green apples, pear skins, sweet hay and pecan nuts. Then some cinder toffee, hot cross buns, damp hessian, and chocolate éclairs. Underneath, there’s wet slate, charred logs, aromatic tobacco, unlit cigar, faint espresso and some gentle woodsmoke. Layered, to say the least. Palate: Very clean to start with – sweet citrus, a touch of rock pools, some old shells and BBQ’d prawns. Then some caramel, Banoffee pie, baklava, Ecclefechan Tart and a dry nuttiness, before sandalwood, mahogany, old books, Moroccan spices and some bonfire embers come through. The smoke stays very much in the background. Finish: But then the smoke surges through! Lingering woodsmoke, Morello cherries and chocolate brownies. Overall: Firstly, let’s look at the straight up liquid, and blimey is it a very well crafted whisky. Some rich, dried fruit, some light, sweet, orchard fruit, some spice, some oak, and some smoke, all wrapped up in a velvety robe. This whisky ticks all the right boxes in terms of flavour, but as ever, the question of price comes into play. £150 for a 21yo single malt is high, but for a blend it’s very, very high. And ultimately that’s where this whisky falls down… but hey, I don’t know how long my chukkas are or how many divots I’m expected to stomp down in my high heels. In other words, I’m not the target market for this product, but the market that this product *is* targeted at will hopefully be persuaded to put down their bubbles, or Pimms cups, or overly-garnished G&Ts and pick up a dram of whisky. If this whisky can be the vehicle to convert new drinkers to the category, then I’m all for it. This entry was posted	on Wednesday, October 17th, 2018 at 9:45 am	and is filed under Reviews. You can follow any responses to this entry through the RSS 2.0 feed. You can leave a response, or trackback from your own site.